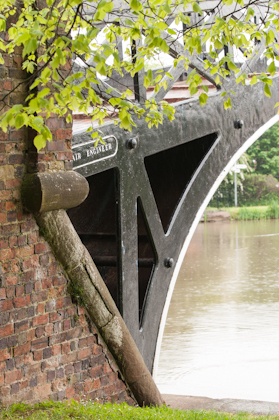 The ornamental stone springing point of the semi-elliptical ( three centred ) arch under which boats pass from the Oxford Canal onto the Coventry Canal at Hawkesbury Junction just north of the city. The junction was formed at its present location in 1803 following a long and protracted argument between the two canal companies as to where it should be connected. 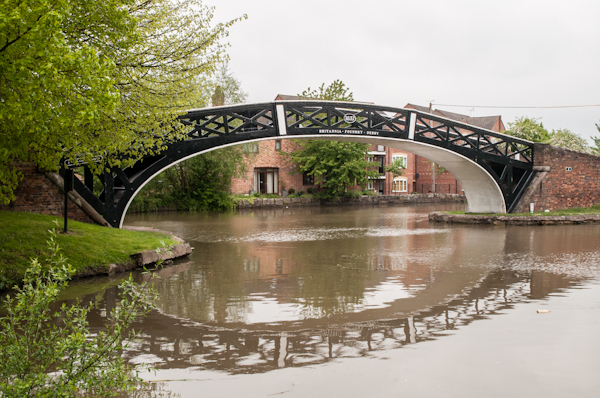 The bridge was constructed by the Britannia Foundry of Derby prior to its takeover by Andrew Handyside and Company in 1848. The site of the foundry has long since gone remembered today only by the street name in a new housing estate , Handyside Street. The photograph is looking towards the Coventry Canal. 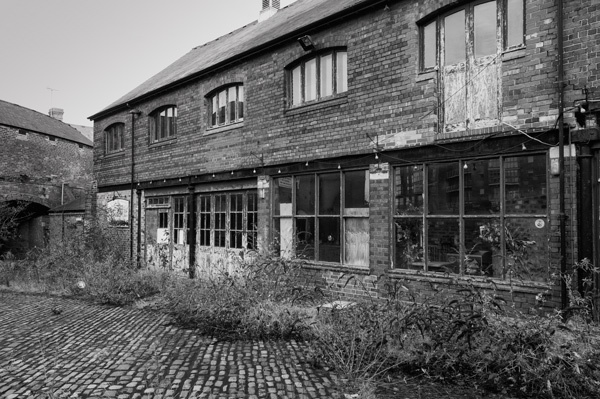 There are many redundant small factories and workshops in Birmingham. The one pictured here fronts onto Sheepcote Street, and appears to have been, to look at the roof lines, two separate buildings with two separate uses at one time. To the rear of the building there is a wharf giving access to the Birmingham Main Line canal. Adjacent to the works, on the corner of St. Vincent Street and Sheepcote Street there is the “Roundhouse”, part of which can just be seen to the extreme left of the image, a horseshoe shaped building constructed around 1840 for the LNWR as a coal and mineral wharf, it is now a children’s nursery.